If you follow me you already know I am a huge Disney fan. Personally as a photographer I think Disney (World, Land, Paris, Hong Kong, etc.) is the best place to photograph. Not only is there so much to shoot, Disney parks have so much detail you can’t make it too far down Main Street at Magic Kingdom without shooting at least one hundred photos. The other thing about Disney parks is how they “transform” at night, as evident by the picture here of Spaceship Earth. 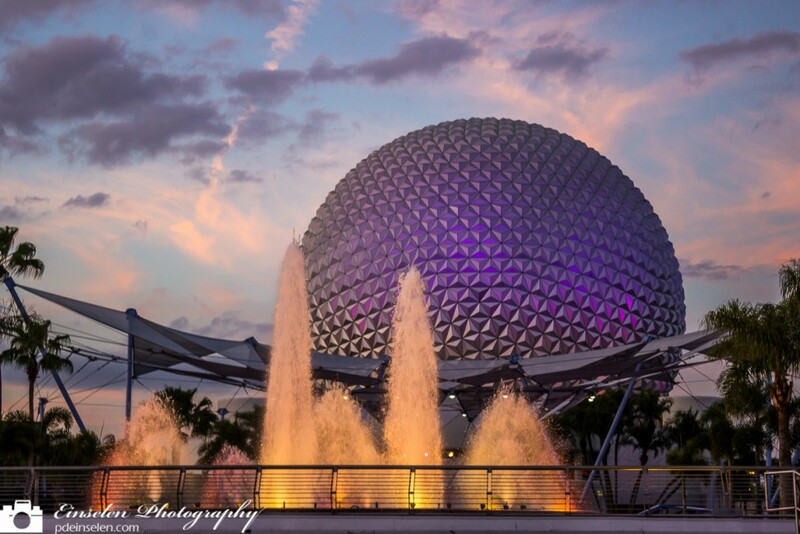 Spaceship Earth is lit up with purples and pinks which matched the sunset perfectly in this shot. It also helped that the Fountain of Nations is lit up with an orange light, I am guessing not by accident, which adds to the color of the shot. I did edit the photo in both Lightroom and Photoshop. Despite my patience some of the park guest this day did not want to cooperate so I had no choice but to digitally remove them. Don’t worry I did it in Disney fashion and waved some pixie dust to make they magically disappear.